I’m not even sure how to start this blog about the Grand Canyon’s South Rim. When I originally plotted my course around the USA, I simply glanced at the number of stops and miles on drive Reader’s Digest drive. For every four stops or 100 scenic miles on average, I allotted one day. After reviewing the plan the night before I depart, I mentally determine general stopping points. Factors that go into my decision making are interesting locations, shower and food needs, and cell service availability. With this in mind. I and adjust my tour accordingly. Upon reviewing the drive along the Grand Canyon’s South Rim, many of the stops were merely overlooks. Visiting overlooks takes far less time as compared to hikes. Originally I set aside two days for the South Rim. I adjusted my visit to one day after discovering the Grand Canyon’s South Rim only included 8 stops and 35 scenic driving miles. Additional items included my decision making process to only stay a day were the fact I had already twice rafted through the Grand Canyon twice, my limited knowledge of the Grand Canyon’s South Rim activities, and the perceived effort of finding a place to stay for the night. While I take while to make up my mind, once decided, changing it proves difficult. I must say, if I had a do over, this may have been a place for a retry. First and foremost, there are a million places to stay both inside and outside the park. Second, cell service is plentiful in the populated areas. Finally, restaurants are nearby, and a handful of hiking activities exist at the Grand Canyon’s South Rim. Despite knowing the Grand Canyon is a major national and international attraction, I was surprised at the extent of commercialization. I guess I thought Williams, about 60 miles from the Grand Canyon’s South Rim, to be the last major stop. I presumed the area nearby the southern park entrance would be somewhat remote…not so. I imagined that a road would pass by the canyon, tourists could pull off into the parking lot, walk up to a railing and snap a photo, and perhaps walk a few hundred yards near the edge of the rim. Little did I know that a 13 mile paved trail without railings mirrored the southern rim. Moreover, I didn’t realize visitors could test their stamina on a few trails leading into the canyon, but not have to commit to making the 7.8 mile trek down to the river, resulting in over a 15 mile roundtrip hike that isn’t recommended as a day hike. In addition, I expected the most well known trail, Bright Angel, to be extremely narrow when in fact it was generally four to five feet wide. While I’ve bungy jumped and skydived, standing too close to a ledge tends to make my stomach churn, my head spin, and my knees buckle, so I didn’t think I’d enjoy the Bright Angel Trail. Had I really understood the opportunities at the Grand Canyon’s South Rim, I would have stuck to my two day plan. I would have at least attacked the 3 mile roundtrip hike down to the first Rest Stop on Bright Angel Trail as well as the Grand View Trail. On the rim, I would have walked a portion of the trail with Petey and bounced around to some additional vistas. Having said all that, a day was enough for me this go around. Though I think it would be fun to hike to the canyon floor and to stay at Phantom Ranch. I’m told that 80% of people who have visited the Grand Canyon have only been to the rim. At the risk of offending a few readers, those who have only visited the rim have short changed themselves. Don’t get me wrong, one must admire the grandeur of the canyon (277 river miles long and 1 mile deep), marvel at the length of time it took to form (millions of years), and wonder in amazement at the explorers who found a way to cross the 10 to 18 mile wide gorge. But the experience at the rim is entirely different from the experience on the canyon floor. It’s like going on a sightseeing tour as opposed to an adventure. While the sheer size of the canyon is indescribable and had to be both an inspiring and frustrating site to early explorers heading west, the raging waters of the Colorado River that look like a calm creek from the rim provide rafters with an exhilarating journey through the largest navigable rapid in the Northern Hemisphere – Lava Falls. As the cool breeze at the rim keeps temperatures near an enjoyable 8o degrees for summer tourists, valley goers tolerate icy 42 degree water released from the depths of Lake Powell to find relief from the stagnant 100 degree heat below. The immense serenity visitors feel as they gaze at birds gliding above the multitude of butte, spires, and plateaus contrasts with the intensity adventurers on the canyon floor feel from vigorous hikes to cliffside Indian dwellings, body surfing the Little Colorado’s rapids, and leaping from the tops of waterfalls to pools below. It is like visiting two separate places in one. Now to start the description of my day…My “sightseeing” day began in Williams. After visiting the local coffee shop operated by two kids hardly thirteen, I searched for a geocache in the local cemetery. The high winds and tall trees wreaked havoc on my gps. My device never registered that I was within 140 feet of the cache. However, based on the description of the cache location and the hint, I’m quite certain I was near ground zero. While I failed in the caching department, I may have found the most colorful cemetery in America. All the graves were decorated with anything from plastic flowers, beer bottles, day of the dead memorabilia, paint, stuffed animals and flags. It was quite a place. While I haven’t visited too many cemeteries in my lifetime, this one ranks as a favorite. We continued on to the Grand Canyon’s South Rim where we visited Yavapai Point and walked a few miles on the paved rim trail. Given all the photos I took, the short distance took a long time to cover! I find the vastness of the Grand Canyon awesome, but also slightly discouraging. The haze, even on a clear day, seems to wash out the colors of the canyon walls. According to the information sign, I could see 150 miles, yet I felt like my eye was only picking up a tenth of the colors. After the walk along the point that wasn’t extremely crowded, we drove west to a parking area near the Bright Angel Trailhead. The shuttle bus stops here to take visitors on a 75 minute West Rim tour. This does not counting the time it takes to hop on, hop off, and wait for another shuttle bus that passes by every 15 minutes. The line for the shuttle bus looked at least 30 minutes long. The wait time coupled with being in a car all day, encouraged me to explore the Bright Angel Trail rather than the Grand Canyon’s South Rim. As I previously mentioned, I was pleased to find a trail much wider than I had imagined and well maintained. Most of the folks along the first mile of the trail were simply rim visitors. However, I met a couple that had packed out from the campground below. They seemed slightly worn out, but enjoyed the adventure. I also couldn’t help but think of Oprah who filmed her dieting and exercising efforts here. That had to have been chaos! After meandering down and then back up Bright Angel for only an hour, I joined Petey in VANilla. We followed the road back to the east and stopped at a handful of overlooks, including: Grandview, Moran Point, Tusayan Ruin, Lipan Point, Desert View and Watch Tower. My favorite overlooks were Grandview and Lipan Points. I found these spots to be more magical than the views located near the hype. Grandview Point came to be in 1890, when prospector Pete Berry staked the Last Chance copper claim 3,000 feet below the rim on Horseshoe Mesa. This prospecting began a 17 year flurry. Despite the mine’s ore earning a World’s Fair prize in 1893 for being over 70% pure copper, the high cost of packing ore to the rim and shipping it to be refined doomed the operation. Pete Berry sold the mine in 1901, and the new owners ceased operations in 1907 when copper prices plunged. In the meantime, Pete Berry began operating his Grand View Hotel. Tourists took a 12 hour stagecoach ride from Flagstaff to take a mule ride into the canyon. Thus began Grand Canyon tourism! Grandview was the canyon’s most popular tourist destination until the Sante Fe Railroad reached Grand Canyon Village, 11 miles down the road. At this time, tourists chose the train over stagecoach transportation. 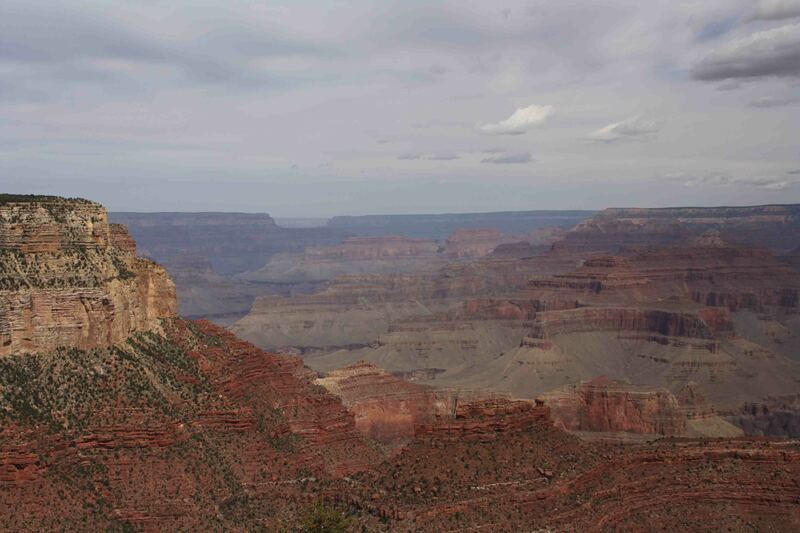 Both Grandview and especially Lipan Point provided wonderful views of the Colorado River. Hance Rapid could be spotted below Lipan Point. The rapid is almost a mile in length and drops more than 30 feet. While on the river, this rapid appears enormous, while on the rim, it was hardly visible. Without seeing the information sign, I would have thought I was only watching a trickle of white water. While Moran Point is named for the artist whose paintings helped persuade the federal government to preserve the canyon for all Americans, I didn’t find this view to be particularly interesting. Regardless, I’m thankful that Moran raised awareness of the Grand Canyon. I moved on to take a quick walk through the Tusayan Ruin and finally to visit Desert View. I was really looking forward to climbing the 70 foot Watchtower perched on the edge of the cliff. Unfortunately, it was closed for renovation. The tower, designed by Mary Colter, was completed in 1933. Her goal was to build a structure providing the widest possible view while harmonizing with its setting. For more information on the Grand Canyon and how it was formed see: http://en.wikipedia.org/wiki/Grand_Canyon as I could obviously write for days. It even tells you how many over zealous photographers have fallen over the edge. the Phantom Ranch is a fun place. We stayed there in the 60’s yikes!!! the hike is awesome just like your photos!!!!! !